I 100 presents: An Evening of Comedy! Tickets are available at the link above (until 2 hours before performance) or at the Hangar Theatre Box Office starting at 7 p.m. on the 9th. Tickets are limited, and selling quickly! 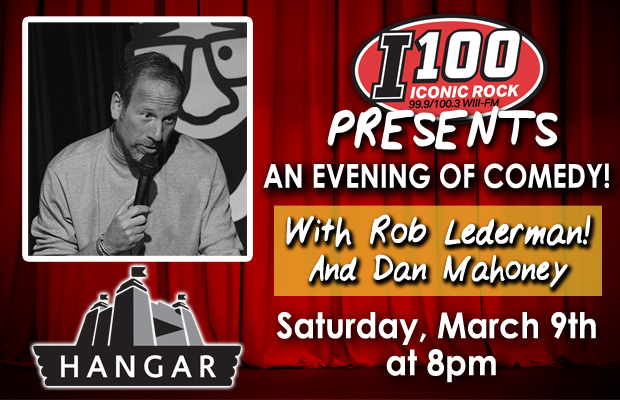 Rob Lederman has toured nationally for over 30 years, headlining clubs and performing with comedy legends such as Don Rickles, Tim Allen, Jay Leno, Dennis Miller and Jim Carrey. In the late ’90s, Lederman landed a freelance comedy writer for David Letterman’s production company, Worldwide Pants Inc.